← So what about it? After a couple of months using ABS we decided to try out PLA, but got stuck just before hitting “start building” because we had no blue tape with which to cover the kapton bed! So, after trying out some prints I can assure any italian (or european?) 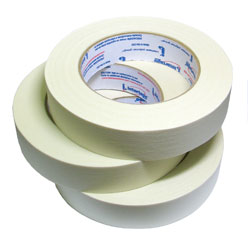 guys having problems with acquiring blue tape that the common masking tape works fine, even though we have seen differences between the brands because some are slightly more rough on the surface while are others are a little bit too fine.